Egyptian President congratulated Obama on re-election victory, saying he hoped it would strengthen “friendship” between the countries. Egyptian President Mohamed Morsi on Wednesday congratulated President Barack Obama on his re-election victory and said he hoped it would strengthen the “friendship” between their two countries. 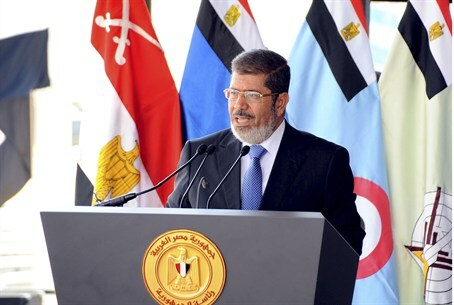 Morsi hoped for a “strengthening of the friendship between the two countries to serve their common interests, namely justice, freedom and peace,” in a telegram of congratulations released by the official news agency MENA. Despite the fall of U.S. regional ally President Hosni Mubarak in last year’s popular uprising, Egypt remains the second largest recipient of U.S. foreign aid, totaling $1.5 billion a year, mostly for its military, AFP reported. In September, however, Obama sparked intrigue over the state of U.S.-Egyptian relations after he said the country, which is now ruled by the Islamist Muslim Brotherhood, was neither a friend nor a foe. "I don't think that we would consider them an ally, but we don't consider them an enemy," Obama said in an interview at the time. "They're a new government that is trying to find its way. They were democratically elected. I think that we are going to have to see how they respond to this incident." Obama’s comments came after a mob raided the U.S. embassy in Cairo, in a protest that was allegedly blamed on a film made on U.S. soil and deemed anti-Islam.